About eight or so years ago I went with a friend to the Milwaukee Arts Board to make very simple argument: while all kinds of public funds go to arts, no one funds “public art.” That is, all public subsidies for the arts went to institutions that were not free and open to the public. So why not start a public art program? They formed committees, which brought in consultants. More consultants came and drew up a master plan. The master plan was dropped when it was revealed that good public art would cost real money and might even annoy people. But that didn’t stop this newly formed group of “public art advocates” from pressing ahead. They proved that tons of art could cost nothing at all. (Have you seen all the Beasties loitering around downtown lately?) By lowering the price they inadvertently solved the other problem with public art. Cheap bad art never offends, unless of course, you happen to really love art. It turned out you can make a lot of politicians and public spirited citizens happy when you add a splash of “meaning” to a place. It is something rather than nothing. Seems like progress, some form of renewal. It’s a landmark! 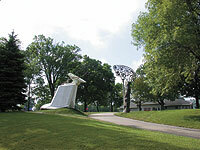 Here in Riverwest, a case in point, is the David Middlebrook sculpture at the entry to Gordon Park (see photo, above right, showing the sculpture in its current context). According to a feature in the July Riverwest Currents, Middlebrook explained that the head of the sculpture on the right contains a “culture kit” consisting of 13 icons that “represent” the history of the people in the area. Native Americans = plants. Books = Irish writers = Catholics. Wheel = Germans, Jews = broken piece of the Old Testament. Mexicans = two pieces of broken classical architecture. Coffee beans = South Americans. Let’s not forget the Vikings who are represented by sardines! And so on. Do any of these make sense? The reduction of peoples to crude logos should be offensive. Who is this guy to create a logo for Jews? Don’t we already have one? And if you play that glad-handing game, why put the Vikings in and forget the Poles? It just isn’t that easy. Art it is not a just some symbol that we make up to represent something else. If it were, then we could a make a logo for truth and beauty and be done with it. How bad is this art? Think of movie Spinal Tap without a sense of humor; imagine Liberace imitating Thelonious Monk. You get the picture. This is pretentious monstrous kitsch. David Middlebrook has given meaning a bad name and produced a three-dimensional brochure. It’s infotainment. But let’s say for the sake of argument that the art is just fine. Or take the anti-elitist tack — “who am I to tell you what good art is?” So why “landmark” this elegant urban view? 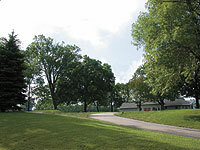 The photo above on the left is what the park would look like without civic graffiti. It’s a classic composition, whole and complete. The walk rises slightly and gracefully curves to the horizon. I was refreshed every time I rode my bike up this little incline and passed into a new world. Here, as Sun Ra used to say, space is the place. A space that reaches from the earth to the sky, as this one used to, is much larger than anything we can put into it. Surely there are other ways to spend $50,000 to wreck this park less. For the same money, park two Mini Coopers on either side of path. Compared to the Middlebrook sculptures, they are thoughtful and well-designed objects. And for the art-initiated, they could be seen as ready-mades, a la DuChamp or Andy Warhol. They would be more fun, and if you got tired of them, they could just be driven away. Sometimes nothing is better than something. Our public art advocates should take a kind of Hippocratic oath to first do no harm and consider natural gifts of urbanity before they “landmark” anything and give new “meaning” to places that are far wiser than they are. Tom Bamberger has an exhibition opening at Leslie Tonkonow Art Works and Projects in New York in September. A frequent contributor to Milwaukee Magazine, he recently won the silver award for art criticism from the National City and Regional Magazine Association. His photographs have been on exhibition at the Museum of Modern Art and the Art Institute of Chicago. Tom Bamberger has an exhibition opening at Leslie Tonkonow Art Works and Projects in New York in September. A frequent contributor to Milwaukee Magazine, he recently won the silver award for art criticism from the National City and Regional Magazine Association. His photographs have been on exhibition at the Museum of Modern Art and the Art Institute of Chicago.